This is typical of the view pedalled in the local area which I find frustrating. I have mates in Torbay who canoe and sea kayak - when I have invited them recently to paddle the Dart I have been told "we're not allowed to in the summer". I have pointed out to them that this is not the case. However, website pages like that above further this distorted view. So . . . I note that on your website you state that there is an agreement between Dart Fisheries Assoc. and the BCU which only allows access from October to March. You further state that there is no canoeing allowed during the summer months. I believe these statements to be incorrect - could you advise where this information came from? I would also ask when you obtained this information, as the agreement that was in force broke down, and Canoe England (part of the BCU) have recently issued a new statement on rivers access. You are correct in that there is currently no Voluntary Access Agreement (VAA) in place between the Dart Fisheries Association and the BCU, however I understand from the Secretary of the DFA that they are hopeful of negotiating a new one with who ever replaces Adam Box. The agreement, which in various forms has existed for many years has always been cited as a sensible model of balancing the use of the river from all the many pressures on it and permitting controlled access for paddlers between the 1st October and 15th March each year. You are wrong and incorrect regarding canoeing during the summer months. Irrespective of the lack of a current VAA the law is clear on navigational rights of rivers in non tidal waters and I attach a document for you to digest. While I am sure the DFA and individual riparian owners have no wish to stop canoeing on the Upper Dart, The Loop and lower Dart in the winter months they are perfectly entitled by law to do so. It is unfortunate that there have been too many incidents this "summer" of canoeists not only paddling the Dart but also causing environmental damage to the breeding areas (reds) of salmon by paddling the East and West Dart above Dartmeet which have never been included in any VAA. I am just pausing to write a response. Ok ... so what's the source of the opening paragraph (and thus the one sidelined). In my experience law is very rarely that specifically defined. Isn't it *that*, or perhaps it's lack thereof, that's at the heart of this whole thing? That material quotes where tidal paddling has been confirmed, and where land and water accesses have been found to be distinct form one another, but not where the general presumption against "public right to navigate in non-tidal rivers" is to be found. It's playing with the semantics, (but the law turns on such things), are we not technically navigating on non-tidal rivers, rather than in them ? ... (Pedantry which is neither here nor there unless that's what the actual legislation says tho' of course (assuming it exists)). Last edited by monkey_pork; 19th-July-2012 at 10:31 AM. Well given that the headers are The Angling Trust and Fish Legal, I'm not sure that it's entriely unbiased. The attached document you have sent me quotes case law for tidal waters - why, if the law is clear regarding non-tidal, is no case law quoted? I think you may find that this is because there is no precedent to quote. In Magna Carta 23 (1472), a public right of navigation is affirmed on all rivers. Lord Lindsey (AG v Simpson) states that the premise of "once a highway, always a highway" applies as much to rivers as it does to roads. Further, Mr Justice Lightman (Rowland v EA) concludes that a public right of navigation may only be extinguished by legislation or exercise of statutory powers (these powers do not exist for unregulated watercourses). The public right of navigation on rivers thus still exists. I believe that there is confusion between control of the fishing rights on the Dart and control of navigation. 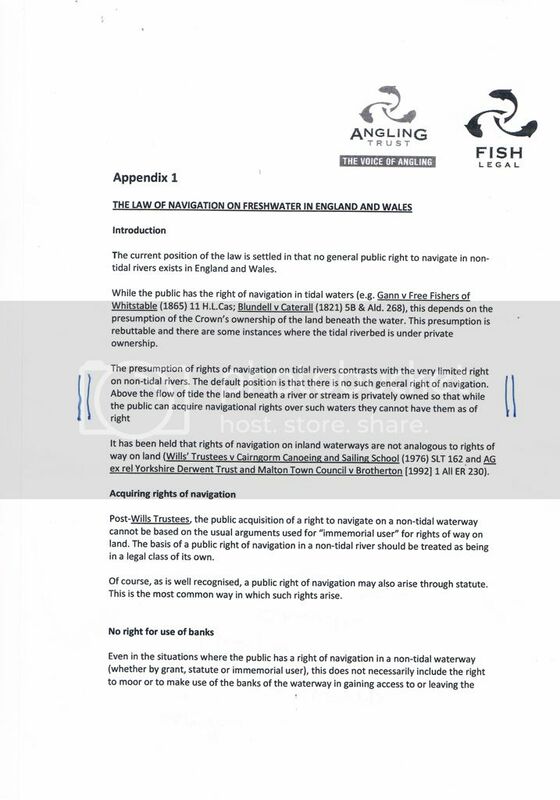 The two are not synonymous - if the Dart Anglers Assoc have documentation confirming they also control the navigation they should publish this to clear up the confusion. I'm afraid that they have no legal powers to stop anyone canoeing. With regard to damaging breeding areas, I believe that the overwhelming majority of paddlers are sensitive to environmental conditions. Further in the Hendry and Tree study into "Effects of Canoeing on Fish Stocks and Angling" (conducted for the EA) they found that "the general conclusion from this study is that canoeing is not harmful to fish populations". The statements on your website I feel are misleading - there is no reason that canoeists, kayakers and wild swimmers should not enjoy the river in a responsible manner during the summer months. Certainly, there is no legal reason. I think you may well be right in that the Wills v Cairngorm case is being selectively quoted. I came across this item - you will have to scroll down to the bottom page 12 to find a note on the "Land Law Afloat"
Quite interesting reading though not heavy on detail but the definition of a public right of navigation is useful. I'm not convinced by this article. The writer states "If a river doesn’t have a public right of navigation and consent has not been obtained from the riparian owner then it is a trespassto row, paddle or even wade in it" but, unlike the rest of his article, doesn't back this statement up with case law. This seems to be very much the problem - the assumption that there is no right of access with no facts to back that assumption up. Last edited by SandfordSailor; 19th-July-2012 at 01:09 PM. I think the writer was merely stating the current position regarding Common Law which clearly shows up the lack of clarity. In the absence of a clear position with regard to Common Law and navigation the more well established Common Law of trespass would appear to be the one that is taken as addressing the issue. Since it seems there have been few if any cases that have succeded on the sole basis of passage along a river then there has yet to be any Common Law that links trespass and paddling down a river which prevents using the rivers. (Unless someone knows of any such case). So trespass seems to be claimed as a reason for preventing passage along a river but in reality it hasn't been tested sufficiently in court cases. However as the definition of a public navigation indicates it is somewhat difficult for the average person to determine if there is or is not a right to use a river. This is taken advantage of by the landowners etc. by claiming rights they do not necessarily have. As I understand Common Law it presumes that if people have done/continue doing something that is not criminal or contravenes established Common Law or Statute Law then as long as the activity goes unchallenged in the courts and therefore no new Common Law is established as a result of the case then one can carry on doing it. I did read somewhere that where rights are not clear that by entering into an agreement with someone to not do something infers that one has agreed that the landowner/tenant etc. has the right to control the activity. PS I'm not a lawyer so the above maybe a load of tosh. You may have inadvertantly simmered Mr Cooper to boiling point. I expect he will be along shortly to advise "STOP IT. IT'S NOT TRESPASS" (see previous access posts ad nauseum). "If a river doesn’t have a public right of navigation and consent has not been obtained from the riparian owner then it is a trespass to row, paddle or even wade in it"
There is no contradiction with our position here. Put simply, there is a public right of navigation on all rivers in England and Wales. It was referred to in Magna Carta and the 1472 Act for Weirs and Fishgarths. No subsequent legislation or court ruling has amended the law as it was in 1472 and therefore the law is unchanged. The fact that Parliament has felt no need to "fine tune" the law in the last 540 years (and didn't feel the need to create new PRNs when passing most of the subsequent River Navigation Acts) is evidence of the clarity with which Parliament last spoke on the subject - "all rivers" means exactly that. Last edited by KeithD; 19th-July-2012 at 03:47 PM. No feedback from the Ea re. there backed signs on the Dart. Time for another call to them and the Duchy. I've had no response from Mr Simpson as well. Follow up email to, err, follow. time to make a concerted effort to tell these people the 'facts' they are spouting are incorrect, misleading , and plain wrong. Chris, are you asking for a re-hash / re-iteration of the access debate? As far as I am concerned there are no rights of access for any of these non-tidal, 'non-navigable' rivers. Nor are there any access agreements - I think the BCU has stated its position quite clearly on this issue. So although there has been no access agreement for the Upper Dart and Dart Loop that I have signed up to, the BCU has at last clarified that this is the case. It is also of no debate that any damage to fish spawning grounds is a criminal offence. So avoid gravel banks and don't trample on gravel river beds during the spawning season. If an EA officer tells you to avoid an area then you must do so. Therefore, if water is sufficient I paddle, keeping to public access points for entry and egress. In the case of the Dart Loop you can egress just before the Dart Country Park I am told. The sooner the Government clarify the access situation and ensure that we have the right to paddle these rivers, subject to certain caveats (e.g. safeguarding the environment) the better. Sue, why I started this is because there is a widely held mis-perception that there is absolutely no paddling on the Dart during the summer months. Websites such as the Dart Country Park perpetuate this myth. As long as paddlers paddle responsibly during the summer months when river levels are appropriate (and there is therefore no risk of damage to gravel beds) why shouldn't they? We don't need an access agreement. Maybe a minimum level agreement? Mr Simpson has not responded to my follow up email. I hope, at least, that I have highlighted to him that the position stated by Fish Legal is incorrect. Dart Country Park are probably trying to appease the local fishermen and landowners, who are in their face all the time, whereas the paddlers come and go. As you & MM say, just use common sense and carry on. Its possible to get out at Holne Bridge, but parking is very limited, so pick/up drop off only. You may have inadvertantly simmered Mr Cooper to boiling point. Sorry Chris, I have been away. That might have been one of my postulations rather than a legal doctrine but I still think as a concept it has validity. Sounds like wishful thinking (based on a half truth)!. If we were claiming a private right of navigation I think it can be lost in this way but not a public right of navigation which can only be lost by statute or exercise of statutory authority. Mr Justice Lightman said ‘PRN may only be extinguished by legislation or exercise of statutory powers or by destruction of the subject matter of PRN e.g. through silting up of the watercourse.’ (Josie Rowland v Environment Agency. 2002. Case No: HC . 0102371.) Lord Lindley in the House of Lords said ‘the doctrine once a highway always a highway is, I believe, as applicable to rivers as to roads’. (Simpson v A-G  AC 476, 510.). One aspect of this debate that doesn't get an airing is that Laws in this country have been made by intelligent people not idiots, their politics may vary wildly and self interest is often the motive for new laws, but there is always a good reason at the time for a change in any law. In general the Laws that are made are based on common sense, so how could a situation ever arrive that would remove a Public Right of Navigation and replace it with a system that gave any small river bank owner the right to decide who navigates past his property, the idea is just crazy, it would never happen. Any such Law would work against the big industrialist and estate owners who were running the government for most of the last 540 years, they would have been held to ransom and prevented from getting their goods down the rivers. They would never have done it and as we know they didn't. While I am new to this paddling lark and mostly naive to the finer points of access, I gather that paddling the Dart is a no no in the summer months. I've just come back from a holiday in that area (w/o canoe) and spent a fine afternoon approx 2 miles downstream of Dartmeet. There were literally hundreds of families enjoying the sunshine, swimming, tombstoning(!!) from the rock faces, scores of dinghies etc. If canoes are banned to protect the fish in the summer, how can all this be ok????? I gather that paddling the Dart is a no no in the summer months. The only thing that should prevent people paddling the Dart in the summer is a lack of water. If the level is okay, then paddle away! (I might coin that). Spot on, I've had enough of these access threads on every paddling website, I've not read one for many months. If theres water on the river and there's access to the bank then paddle, if some idiot complains just tell them to phone the police, if theres no damage then they can forget the criminal trespass rubbish. Be strong, we all paddle in groups in the most part, laugh, load and leave (think I'll coin that). If canoes are banned to protect the fish in the summer, how can all this be ok????? It's not to protect the fish, it's to reserve the river for exclusive use by anglers. Oh, and as everyone keeps saying, you are not banned. Arrrr..,that be a lesson to us all Quicky.. I have been looking at the legality of CE access arrangements, see Are access arrangements legal ? Thread. Now the one for the river Dart seems the most onerous and potentially have the most issues so would make a suitable test case to roll out the Dovedale victory (see andybiddulph.co.uk for details). I have already made the first move writing to CE. Without prejudice to the matters raised in my e-mail of the 24th July 2013, I intend to place the Dart Access Arrangement under closer scrutiny. If it is contended that I, either as member of CE or as a member of the public, have any obligations under the Dart Access Arrangement then as a matter of natural justice, probably under the laws of contract, and certainly under PD-PAC 4.4(4) following the request herein contained, I have a right to know to whom I may have these alleged obligations. Could you please provide me with the details, including contact details, of all parties to the Dart Access Arrangement together with the details of the geographical extent of their interests. If this information is in any way confidential this reduces the Dart Access Arrangement to a private contract between individual persons in CE and the other parties and so places no obligation on anyone who is not a party to the Dart Access Arrangement. Alternatively you could make a statement confirming that no member of CE or member of the public is affected by the Dart Access Arrangement which may not modify the public right of navigation which is recognised by law, irrespective of time or place and according to the quality and capacity of the river. PD-PAC requires that the requested information be supplied within 14 days of the date of this e-mail. Failure to give an adequate response within the requisite period will be taken as an admission that the Dart Access Arrangement is entirely void. I don't know the river. Are there any local paddlers who would like join me to form a working group to assert the PRN and write the guide so we can all paddle all year round? Send me a PM if interested. Andy - as in my first post, there currently is no access agreement for the Dart - this is a good thing. I believe that the recently retired access officer for the area has made it known (certainly on UKRGB) that this is the case. Thanks John. I paddle the Dart reasonably regularly - whatever time of year as long as there is enough water. This appears to be the pragmatic approach taken by more and more paddlers on all sections of the river. In acting courteously and paddling responsibly I believe that the antagonism between the paddling and angling communities on this river is diminishing. I personally would not like to "up the ante" when, generally, the situation is improving on this river. There is no access agreement but there is an access arrangement http://www.canoe-england.org.uk/medi...ement_2012.pdf which looks exactly like the old agreement. This is what I am challenging. How did the follie a deux sneak this past everyone? Do DFA know about it? Did they put this down as a "partnership" on their funding form? Is this obtaining money by deception? In acting courteously and paddling responsibly I believe that the antagonism between the paddling and angling communities on this river is diminishing. I personally would not like to "up the ante" when, generally, the situation is improving on this river. As I have said at length elsewhere, good manners and common courtesy will have to be the mainstay of the new social etiquette that I call learning to share. I am glad to hear that it happening. I am not trying to stir things up on the Dart. My beef is with Canoe England for not working within the rule of law and actively working against the rights of the British people and against the growth of harmony that you tell me is happening. I want to paddle from Buckfastleigh to Totnes in Aug or Sept. Any reason why I shouldn't? Can find no recent definitive info and don't want to mess things up for future access.